On Wednesday, Puerto Rico’s Department of Public Safety increased the island’s official death count from Hurricane Maria, from 55 to 58. This is the department’s first update in about a month. But according to reporters on the ground, academics, and just about anyone who’s paying attention, the true death toll of the disaster is much, much higher. In the more than two months since Hurricane Maria left Puerto Rico in a state of humanitarian crisis, media have been reporting on the disaster’s suspiciously low official death count. To understand why, you should understand how the death count works. Both direct and indirect deaths are supposed to be included in the official toll. Basically, officials have to determine whether the death would have happened had the hurricane not occurred. Before a death can be added to the official list, coroners must send the body to San Juan so that a medical examiner can review it, or an examiner must go the pueblo to take a look. The data-collection system is cryptic, at best. Doctors don’t have the time to actively investigate each death, and the Puerto Rican government appears to be relying on the public to notify it of hurricane-related fatalities, according to Vox. 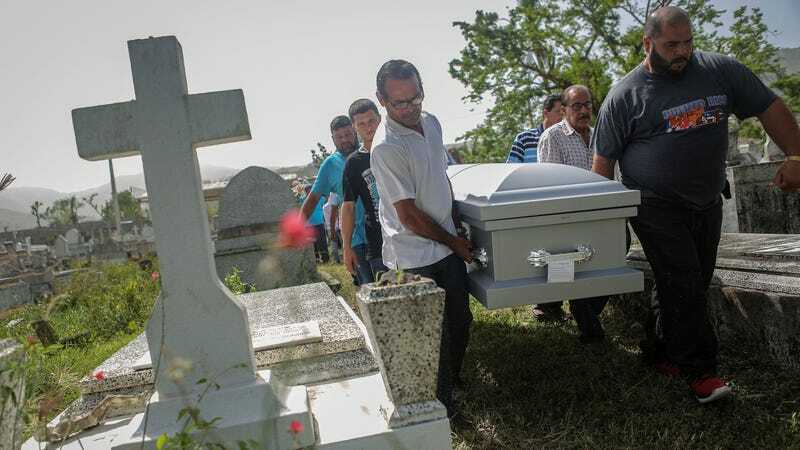 The new deaths paint a grim reality of what Puerto Ricans experienced during the hurricane, and what they continue to see in its wake. One victim, in Carolina, was bleeding from the mouth and eventually died days later in a hospital, according to ABC News. Another one of the deceased died in a boat in Vieques. The third new fatality occurred in Cayey after the individual, Quintín Vidal Rolón, suffered burns and gas inhalation from a lamp that accidentally fell on his home a month after the storm. The department added his death after CNN reported his story earlier this month. Reporters visited 112 funeral homes on the island—roughly half that exist—and they found the death toll could be closer to 500. This has been corroborated by researchers who spoke with CNN. Their analysis found that September 2017 saw 518 more deaths than previous years across all of Puerto Rico. The number of deaths directly attributable to the hurricane changes depending where one looks, though. Puerto Rico’s Center for Investigative Journalism identified 47 deaths related to the hurricane earlier this month. That’s in addition to the official count. Vox reports the number of deaths could be 20 times higher than officially deemed. The Department of Public Safety told ABC News in October that 911 cremations took place between September 20 and October 18. These deaths, apparently, were related to natural causes. No one is buying that the number of deaths actually sits as low as a few dozen—especially after President Donald Trump visited Puerto Rico in October. During that visit, he (among other things) tried to downplay the extent of the disaster given the low official death count, comparing Hurricane Maria to, what he called, “a real catastrophe” like Hurricane Katrina in 2005. Even in Hurricane Katrina, though, the death toll was under debate. Investigators found it sat at least at 986. They took years to decide on that number, and never felt 100 percent certain about it. More than 10 years have passed since Katrina—and more than two months since Maria. How long does it take the U.S. government to figure out how to accurately account for how many citizens it’s lost to a natural disaster?